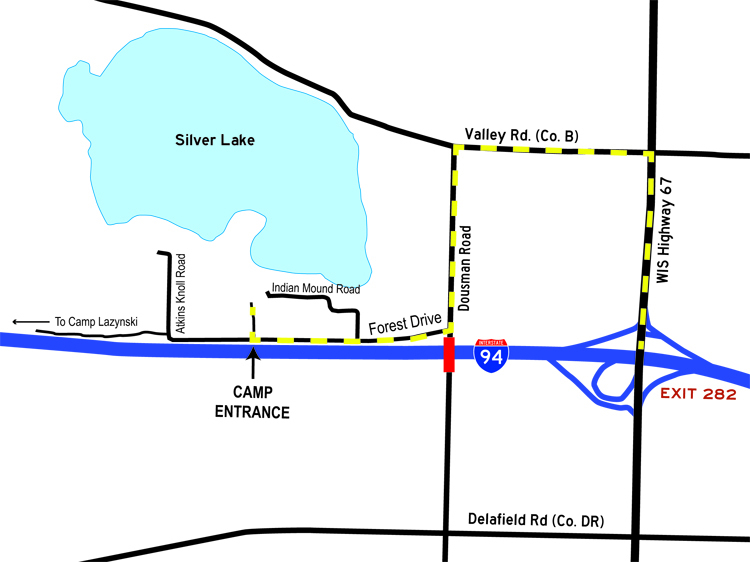 The Interstate 94 bridge over Dousman Road near Indian Mound Scout Reservation is being reconstructed during the spring and summer of 2016. This closure means that Indian Mound Scout Reservation can only be accessed from the north. Below is a map of the construction area. Please note the closure of Dousman Road (marked in red) under the I-94 bridge. The detour route is marked in yellow. Please take exit 282 to Highway 67. At WIS 67, turn right (north). Turn left (west) onto Valley Road (Co. B). Turn left (south) onto Dousman Road. Just before the interstate bridge and the construction zone, turn right (west) onto Forest Drive. The camp entrance is about 1/4 mile past Indian Mound Road and is marked with welcome sign. For more information, please see the road construction bulletin provided by the Wisconsin DOT.